Watercooler Wednesday: WWC189 - The Watercooler Rock Star and Rockers! Tuesday has rolled around again and it's time to announce our Watercooler Rock Star and Watercooler Rockers for Heidi's "All About Holidays" challenge. But first, we'd like to thank all those who played along with us. Beautiful entries that make our choices so much harder but we think you are all starts. Well done! Heidi's choice for our Watercooler Rock Star is Katrina's wonderful light the way design. Following the winner are the Watercooler Artists choices for the Watercooler Rockers. Heidi's Winner: I love the way Katrina has repeated the Christmas lights in the stamped image. The embossed lights with the sparkle on them, which she has in the background, fit so well with the die-cut Christmas light in which she has stamped the image. And what a perfect sentiment! Congratulations, Katrina! Here is your badge to proudly display on your blog designating you as our Watercooler Rock Star. Marsha's Choice: Izzy has made an absolutely gorgeous clean and simple Christmas design. 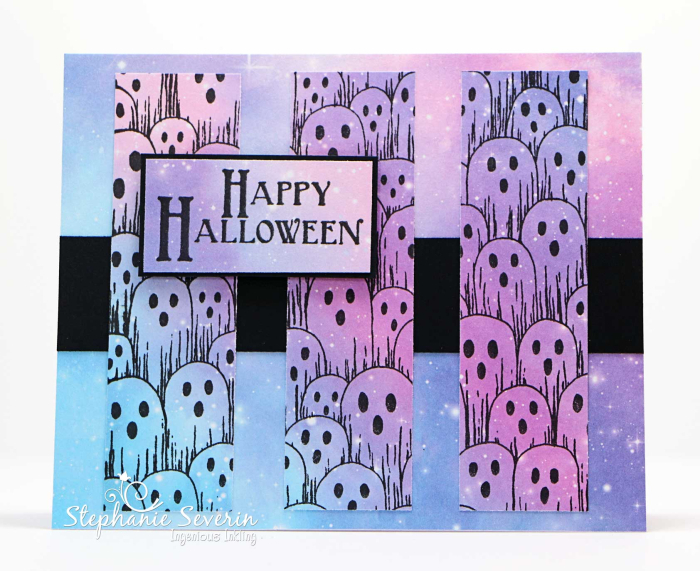 I love the combination of stamping and die-cuts. Gail's Choice: Love those little ghost faces. Stamping them on the DSP really adds interest. 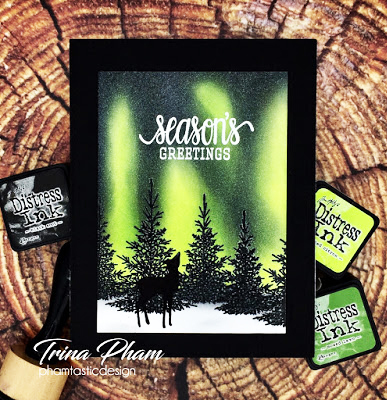 Tristan's Choice: I love the stunning background Trina created. It really glow and highlights those trees beautifully. Kath's Choice: This is a darling card with wonderful coloring and a sweet image. The paper and embellishments make this card a winner. 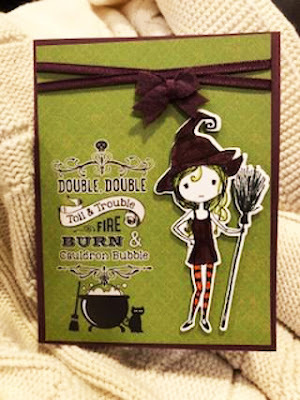 Crystal's Choice: Donna's little witch so adorable. I loved her coloring and the not-so-spooky layout. 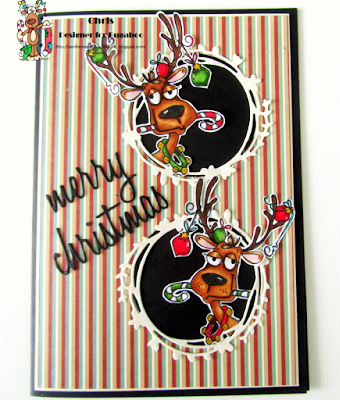 Helen's Choice: Chris has created a super fun card with those wonderful reindeers popping out of the windows. Great colour combinations and added elements. Congratulations Izzy, Stephanie, Trina, Ruth, Donna and Chris.. Here is your badge to proudly display on your blog designating you one of our Watercooler Rockers. There's our lineup for this weeks' Watercooler Rock Star and Watercooler Rockers. Be sure to come back tomorrow, October 3rd, for our next Watercooler Wednesday Challenge. You won't want to miss all the wonderful designs by our Watercooler Artists. 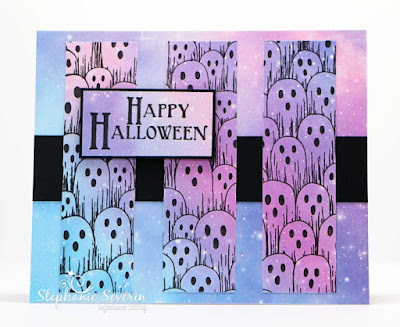 Thanks so much for highlighting my card as the winner! How exciting when there were so many beautiful cards/projects! Congrats to all!